Parents, teachers and students alike find The Violin Book Series right for success. Comments are pouring in from Parents who used The Books with children of all ages. By their own accounts, the results are uniformly spectacular. The Magazine for Homeschool Families. "I think the book [Book 1] was very good in that it broke everything down into simple steps and was easy enough to have him [7-year-old son] read himself. He wanted to play the fiddle but was very negative - saying it was too hard - it was nice to show him how easy it could be. Thanks!" "For someone that knows nothing about violins, like myself, this book explains and demonstrates the learning process clearly and simply so I can help my child." "Can't believe how fast Ashley has progressed! The books are very informative and fun. Thank you!" "It's easy for me to follow his practice and help him study what he should be accomplishing." "Well illustrated. Easy for parents to follow." "Since I know practically nothing about music, the book was written so that even I could understand it. That was a great help!" "It's very exciting to watch how Katy is advancing and Playing Songs. We're very excited and Proud of her." "This is very important for learning violin, because it's let my child think that learning the violin is great fun!" "For a starter, Sid found this book easy to read, follow and understand." "I wish this letter to serve as a testimonial on how your violin instruction and books have helped my son, Brian. "Brian is a wonderful and challenging six year old boy, who would rather run than sit. When a friend suggested to me that music lessons would help Brian focus and eventually help with reading and math, I was thrilled. "I was fortunate that I already knew of a set of twins that were taking violin lessons. Their mom had already told me about this wonderful teacher and how well her children were doing. "I still questioned her further as Brian is such a handful, would she be able to tolerate him and his inability to sit. She assured me that if anyone could teach Brian it would be Eden. When I called Eden for our first lesson, I prayed for the patience of a saint and the wisdom of a great teacher. I was lucky to find both these qualities in Eden and her books. "Eden's books describe on a child's level what needs to be accomplished during a lesson, and yet still appeals to the adult who is helping the child. The books make it easy to understand the violin and the notes and eventually be able to play the songs. The progression of easy songs to more complicated has helped Brian feel a great sense of accomplishment. "In closing I would like to say that Brian has been in lessons for one year. At this point according to his teachers he is ahead in reading and math, and they have seen an improvement in his focus and his ability to understand verbal and written instruction. I am very proud of Brian, but I do feel this could not have been accomplished without Eden's instruction and her wonderful books. "I have just finished reading Book 1 of The Violin Book - and had to write concerning it. The teaching technique you convey in this book contains the essence of how we learn. "You provide a ROCK-SOLID FOUNDATION for the student by first making sure he/she can do the deceptively simple fundamental things correctly - like standing properly, holding the violin properly, etc. (If the basics aren't learned correctly, nothing after that will be right). "You allow the student to experience success at EVERY step - which is essential to sustain motivation. You have given the student the secret - that anything can be done, one step at a time. "The drawings are clear and easy to follow, as are the instructions. The book is full of humor and fun. "You constantly use examples and illustrations from the student's experience. "You fold in the new vocabulary so naturally, and define the new words so simply and clearly that the student learns them without effort. "You make the complex and mathematical study of rhythm as effortless and enjoyable as eating peanut butter or ice cream! "Everyone who teaches anything should be advised to read and study this Book Series; it is a perfect example of how every subject should be taught. "The Violin Book is an example of perfection. Congratulations! It is truly a Masterpiece. "It was great to see you again this year at the Curriculum Fair, and it was a pleasure to finally meet your wife, Eden. It is hard to believe an entire year has passed since the last Fair, but 'Time Flies when you are having fun.' Which leads me to the reason I am writing to you. "Last year you held a workshop about learning the Violin using your self-teaching books and methods. You said that the enjoyment derived from playing a musical instrument such as the Violin or Cello certainly enhances one's quality of life. Also, learning to play the violin leads to learning almost any other musical instrument with ease. These claims seemed incredible at the time, too good to be true, just some sales pitch by a guy selling instruments, the 'Music Man', etc, etc, etc. "Well, we fell for the spiel, and purchased one of your Violins for our son, Christopher. It was a quarter size violin, bright, shiny and brand new. "Believe me, it was an interesting experiment because neither his mother nor I could remember how to read music, never mind teach our son to play a violin! "You assured us that through the use of Eden's well-written and illustrated books, we should have no trouble teaching Christopher the basics. We therefore purchased your books, and then started with Lesson 1, Book 1. "Somehow we struggled through the 1st and 2nd books in just a couple of months. Upon review, we found that indeed, Christopher had learned some very simple but fundamental principals and COULD PLAY some beginning tunes for the Violin. "He was having so much fun, and learning so much, that I thought 'I, at my advanced age, could learn to do that.' Well, I found an old 'Student Violin' and joined my son at his practice. We had great fun, learned a great deal and his mother felt 'left out.' To make a long story short, she had played the Cello as a young girl, and so we found a 'Student' Cello so she could join the family fun. "Now, a year later, the highlight of our day is when the three of us sit down, take out our instruments, and practice together. We are not ready to perform chamber music, but we are learning. We find that our practice time each day brings the entire family together in a way that few other activities do. "Your 'Spiel' was true! And true to your word, we have indeed enjoyed learning through your methods as taught in your books. We have certainly enhanced our quality of life through the enjoyment of playing music. We now participate in our local Youth Symphony (beginners level) and are having a great time playing with others of our skill level. "We are very thankful we attended your workshop that day, because we found an activity that brings us so much joy. We are very grateful to both you and your wife for this marvelous gift you have given us. "I was gratified to see that this year, at the Curriculum fair, there was a great deal of activity at your booth. I saw several Violins leave the building in the arms of aspiring violin students, who can look forward to years of enjoyment through your gift of music. "We are always pleased to recommend you when we are asked about how we started, and we would be honored to act as a reference should anyone need the assurance of one of your SATISFIED customers. "I first met Mrs. Vaning-Rosen at a home school curriculum show in Chattanooga, Tennessee, in July, 2003. 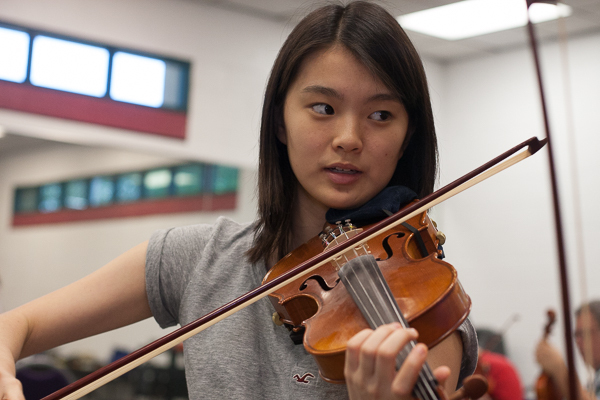 Her passion for the violin, music, and teaching simply radiated. It was not missed by my twelve-year-old daughter, Morgan, who had expressed a desire to play violin for quite some time. Mrs. Vaning-Rosen's series, The Violin Book, was the door to Morgan's journey with violin. "We have found Mrs. Vaning-Rosen's work to be thorough, easy to understand, and highly effective! With only these books as her teacher, Morgan was responsible for her own music education. Her desire to learn was so strong! She did everything the books instructed...exactly. One year later, she had completed five of the six books by herself. In May of 2004, Morgan auditioned for the Chattanooga Symphony & Opera Youth Etude Orchestra and sat second chair in the first violin section. Morgan's technique and habits were so excellent (thanks to Mrs. Vaning-Rosen's thorough curriculum) that her orchestra director was amazed to learn that she had been self-taught. "Mrs. Vaning-Rosen's influence on Morgan and our family did not end with the purchase of a violin and 'The Violin Book' teaching curriculum. As Morgan completed each book and mailed in her certificate of completion, Mrs. Vaning-Rosen responded with personal letters of praise and encouragement. Now we visit with her each summer when she exhibits in Chattanooga, and she enthusiastically invites Morgan to share her progress with the violin. "Life in our house has not been the same since we met Mrs. Vaning-Rosen over two years ago! The 'seed' of her work has blossomed in Morgan who practices violin for an hour and a half each morning. Morgan, now a member of the Chattanooga Youth Philharmonic Orchestra and now a student at Cadek Conservatory, has already begun her own journey in teaching. She has taught The Violin Book series to her younger sister, Katherine, and she dreams of teaching and playing professionally in the future. "I am thrilled Mrs. Vaning-Rosen was awarded 'Teacher of the Year' for the State of Florida. The fruit of her passion, her commitment, and her talent has accomplished what every teacher hopes to do - reproducing talent and the love and enjoyment of music in the next generation! "I just wanted to send a note to let you know how well your program works. My 17 year old daughter purchased a violin and The Violin Book program for herself in May 2005 at the Florida Parent-Educators Association Convention in Orlando. She had never taken violin lessons, nor had she even held a violin prior to making the purchase. She had also never learned to read music. However, she was so excited to be learning to play the violin. I told her if she worked the program faithfully through the summer, and practiced daily that I would pay for lessons in the fall. "She did more than that. She practiced for hours, day and night, all summer. When the Fall came, she did not want to take lessons because she was learning so much on her own from the books. She was playing well by ear, and was about to start teaching herself how to read music. In December, we had an opportunity to see an Ocala Youth Symphony Orchestra concert, and afterward spoke with the conductor. Kaitlin was invited to audition for the orchestra in January. It was then that she began using the program to teach herself how to read music. She also began taking lessons with Alex Lehner-Morin, who uses The Violin Book system with her students. "She has been playing in the orchestra since January 2006, and will do her first concert with them on April 9, 2006. She is also working on a duet with another member of the orchestra, which they will perform together at the following concert on April 23, 2006. "Kaitlin is planning to continue working hard with her violin, and wants to major in Music Education in college. She has also set a goal for herself to be able to play with a major orchestra one day. "We have been very pleased with the program. I am not musically inclined, nor is anyone in our home, so we have been of no assistance to Kaitlin in her quest to play the violin. Thank you for your hard work on this program. It really works! "Because violin can make good sound, I think music is very important! So that is how I like violin." "I like learning how to play the violin by reading The Violin Books and coloring in the pictures in the books. The second part of using the violin hands is my favorite." "I'm having a great time learning to play the violin. The Book helps tremendously! It helps simplify the techniques in order to learn them easier and quicker. I look forward to learning more and more!" "I was very excited throughout the course of this Book as to which new things I would learn next. I think that the practice drills (finger positions, etc.) are excellent in getting my fingers used to the positions. I can't wait to learn more!" "I am writing to congratulate you and David on the publication of your terrific Violin Book series. This is a 'fan' letter to the best violin teacher I've ever had! "I've always had excellent teachers: my mother, who was a concert violinist in New York, then the fine teachers I had five summers at Interlochen, and my year at Eastman with Jacques Gordon, former concertmaster of the Chicago Symphony. "Then instead of following my mother's footsteps, I decided to 'do my own thing' and major in languages at Michigan State, but I was concertmistress of the orchestra and played in a trio on the radio in Lansing. "After college I got married, had children, and enjoyed playing solos in church, in string quartets, and in the Minneapolis Civic Orchestra. "I started going back to Interlochen for the adult Chamber Music Conferences. We had wonderful teaching and coaching by faculty members who had studied at Curtis, Juilliard, and in Europe. "After moving to Florida I was Concertmistress of the Bay Area Chamber Strings. When we needed a new conductor, we found you, Eden. You had just left the Florida Orchestra to get married and concentrate on performing and teaching. You and Myra, your former student who was getting her PH.D. in music in New York, were coaching chamber music groups. It was just like Interlochen! With you conducting our orchestra, it was exciting to give concerts at Ruth Eckerd Hall and the Tampa Bay Performing Arts Center. "You play beautifully, and you know the correct and most effective techniques for teaching your students, at all levels, to play beautifully. You insist on the correct bow placement for the best sound quality and the correct finger, hand, and arm placement for technical facility in difficult passages. "The unique thing about your teaching, Eden, is that you have devoted so much thought to analyzing how the great artists achieve their wonderful sound and technique. And, through your years of teaching experience as a university professor and as a patient, charming teacher of beginners, you've analyzed the problems students have. Better than any of my previous teachers, you can communicate to me exactly what I need to think about so that I'll know what to do when you're not around. "You are a first-rate pedagogue. That's why I'm so pleased that you have put some of your secrets of great teaching into your new method books. You've given students the background information they need. Think of the hours of lesson time they'll save! When they come to their lessons they can concentrate on achieving the goal: fine playing with excellent intonation, tone, technique and musicianship. Teachers have been finding that The Violin Book(r) Series has been the answer to ensuring that all their students get full training in Basics, have fun learning the Violin, and have the benefit of parental assistance during the child's practice periods. Teachers have been reporting that less time is being spent on repairing bad habits, and much more and faster progress is being made during lessons. "I have been using The Violin Book series by Eden Vaning-Rosen for quite some time now, and I am in complete agreement with how the violin is taught and in what order she addresses the new and different concepts. I have spoken with Eden upon many occasions and I have faith and proof that the system she has developed for teaching the violin (and soon to come is the viola, cello and bass book) will continue to give me the 100% success I have had with all of my students that are using her program. "I am writing this because I want others to know that from a teacher's perspective using Eden's books, I do not see any other way to begin a student on the violin. I think that if this system became nationally recognized and everyone began using this method, we would have an overwhelming number of High-Class Violinists!!! The Violin Book is also very useful in helping those student violin players of other systems who may have somehow gone off the track or who are progressing poorly in their lessons on Note Reading, by having them really thoroughly study the materials on Note Reading Basics covered in Book 3. For a more thorough review of ALL Basics, Books 1 through 3 have been proven marvelous tools for taking frustrated students of all systems and picking up all the many things they may have missed in their training. The student was asked to write down his successes along the way, in regards to how these books were helping him gain a sense of accomplishment at the end of several of his coaching periods and as he progressed through the 9-day trial. "I have gained certainty of the holding of the violin and the bow with the right hand, and have learned the best ways to go about bowing, etc. Before, I used confused methods of my own invention, because I had never been taught the correct way. I am definitely winning again!" "Previously, I didn't have a good standard way to place my left hand on the violin. I couldn't shift correctly as a result. That problem is solved! I feel very good with my hand position!" "I am learning the totally correct positioning of the right and left hands on the violin and bow. I am breaking my old bad habits!" "I am beginning to do the right things with my hands automatically, and being able to focus on the song I'm playing! This is the beginning of the real thing!" "This has been a great violin experience. I now have certainty that I can learn to do whatever I want to do in music and violin (and even art). I have the basics needed to learn the good stuff!"